Miss Havisham asks Pip if he is ready to play this time. He says no. (He is still uncomfortable there plus he was just slapped by Estella.) So she asks him if he is willing to work instead. He says yes to that. She sends him across the hall to a different room to wait for her. Even though it is a different room, it is in the same state as her dressing room. This room appears to be a living room/dining room. Dust and cobwebs everywhere. Pip can hear and see beetles and other creatures (mice, spiders). In the center of a large table that also seems frozen in time is some strange centerpiece covered in speckled-legged spiders. I read ahead and found out that it is Miss Havisham’s bride-cake! YUCK! 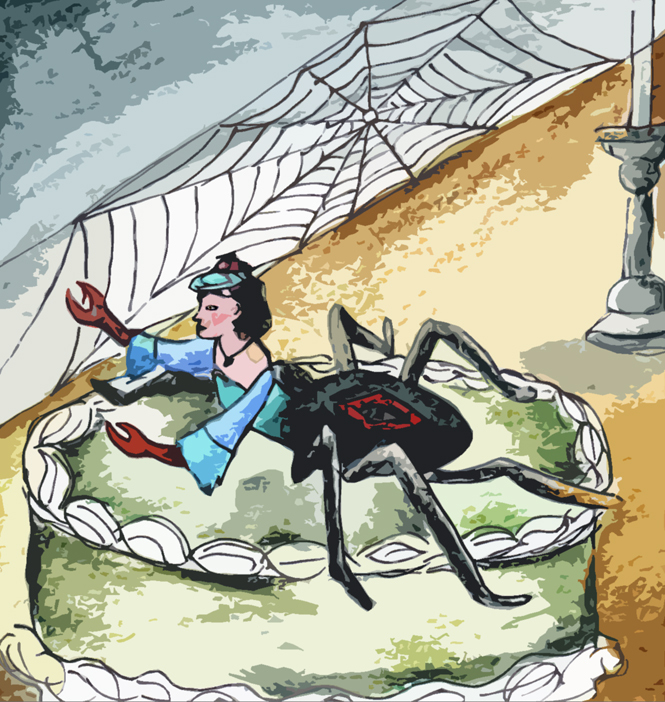 I decided to show Estella as a wicked black widow spider on top of the moldy wedding cake. I created this piece with watercolor pencils, scanned it in and did a little more to it in Photoshop, applying a filter.